Global trade is usually discussed in terms of international regulation. But have you ever thought about how products actually move such distances? 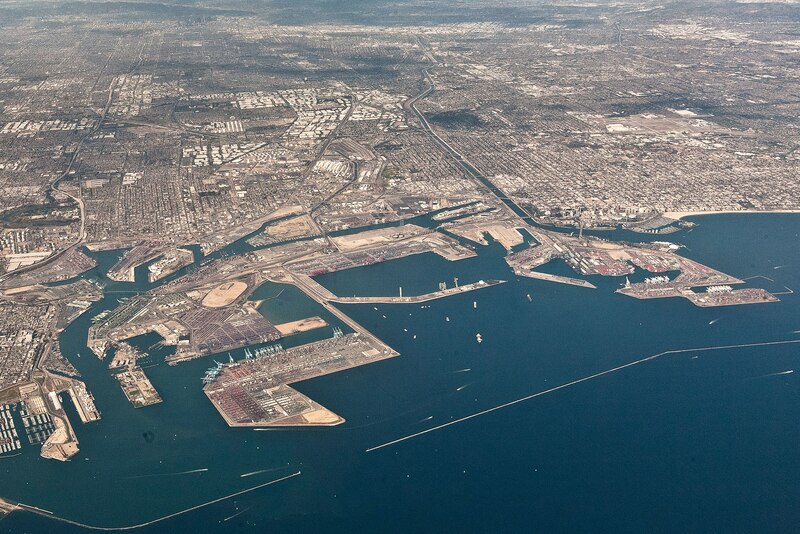 Just a short drive from the feverish grids of downtown Los Angeles is the busiest port complex in the U.S. It is a place where portal cranes tower high above your head, unloading gigantic ships filled billions of dollars worth of cargo bound for the trucks and trains which will rumble off across the landscape. Among all this economic activity, human life is barely visible. Workers are encased within vehicles and their regimented movements – more an appendage to a vast machine than lively labour – and residents of the city are kept separate from what is a heavily securitized industrial space. As in L.A. so it is elsewhere. These infrastructures of circulation have become peripheral to the imagination of the metropolis. Ports have little place in the modern city. And yet such transshipment has been absolutely central to the globalization of trade and the spread of urbanized consumer capitalism. 90% of world trade travels across the sea. A single object is responsible for this: the utilitarian, extruded geometric rectangle known as the shipping container. The suggestion that a single steel box could be the progenitor of monumental spatial and temporal shifts seems almost scandalous: what, after all, could be more innocuous than a box? By definition, it is an object whose utility is defined through its negative dimensions: a box is more useful for the space it does not occupy. Yet by offering the world of commodity production the gift of a uniform box into which a vast array of goods could be safely stored and moved, the container standardized a previously unwieldy and costly world of transportation into a system of formal geometry. In 1956, self-made trucking magnate Malcolm McLean successfully inaugurated the innovation of the container by loading a tanker with 58 containers he had designed to shift easily among ships, trucks, and trains. At the time, half the costs of freight were centered on the intermodal transitions between these vehicles: shifting loose cargo by the banana bunch or fabric bolt was time and labor intensive. By boxing everything up into packable and stackable forms, Mclean’s innovation allowed these costs to drop from $5.83 to 15.8 cents per ton. 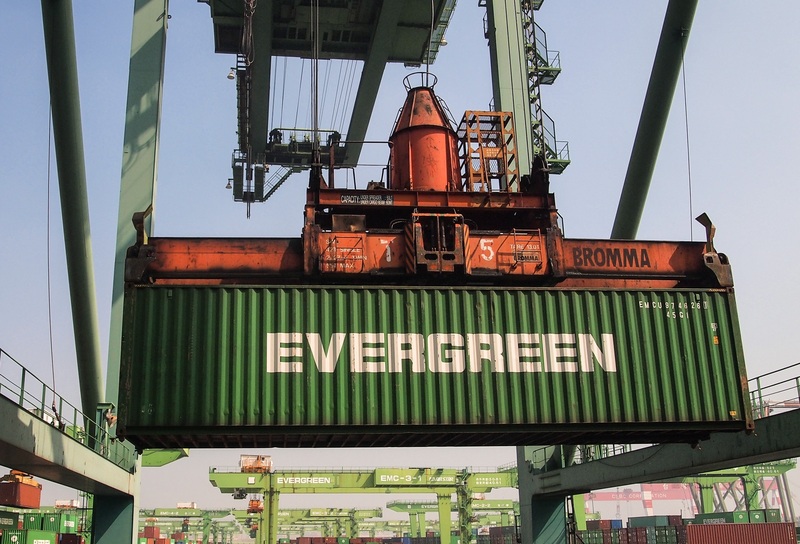 Crucially, the container was thus completely dependent on the support of a vast distributional network of trucks, cranes, and port terminals to enable its transferability. The global extension of intermodal infrastructure seemed only a distant possibility until the Vietnam War, when Mclean’s company Sea-Land was contracted to ship war material and supplies to a region otherwise deeply inaccessible to U.S. troops. By stocking outbound containers returning to the U.S. with goods from Japan, the company showcased how containerization could not only reduce costs but also create profitability. Witnessing the container’s potential led the army supply operations general Frank Besson to later report to Congress that the container was not “just another means of transportation,” but an object whose full benefits could “only be derived from logistic systems designed with the full use of containers in mind”. As an object, then, the container was designed with an encompassing logistical vision in mind, one organized around the idea of ‘the supply chain’. To benefit from this was to permit the conscious moulding and manipulation of large-scale physical environments, from the dredging of sea beds to the destruction of forests, often in conjunction with military activity. These spatial encroachments soon provided manufacturers and retailers with new horizons of global mobility. By the 1970s, container shipping had become so cheap, efficient, and resilient, that corporations began to treat territorial space itself as a fungible commodity, moving industries from one cheap labor source and real estate location to another, seeking ever lower production costs in far-flung locations. The containerized supply chain not only aided capital’s hypermobility; it also altered the temporalities of production. Computers and algorithmic planning were articulated with the container to inaugurate the just-in-time organization of inventory and delivery systems: algorithmic tracking generated models that could predict what customers want, and intermodal containers ensured they could be delivered to customers at the time they were needed. This new sensitivity to precise time scales allowed manufacturers to avoid surpluses and buffer against shortages. The unproductive ‘dead’ time during which products usually had to sit on warehouse shelves was eliminated. The container also afforded temperature-controlled shelter and protection for goods both perishable and non-perishable, maintaining the quality of products even as they travelled vast distances. Ever greater effort was taken to devise logistical technologies that automatically anticipated and insulated the movement of goods from disruption. The containers’ staid metal walls also bring about the radical opacity of its contents. Allan Sekula best illustrates this point when he writes of containerization in fishing habours that “a crucial phenomenological point is the suppression of smell. Goods that once reeked – guano, gypsum, steamed tuna, hemp, molasses – now flow or are boxed”. Where it was once immediately apparent what ships were carrying, today all that is visible is the tin box itself. Containers may just as well be smuggling cocaine in sacks of rice, undocumented immigrants, and illegal arms as they might be carrying teddy bears and electronic parts. Shipping manifests have to declare the contents of a container, but these are notoriously unverifiable, and lying about the contents of a container to smuggle contraband and people is common. The ‘human element’ undermines the technological control. In 2007, the U.S. Senate defeated an amendment to a Homeland Security Bill championing 100% container scanning at all ports within five years, turning instead to a strategy of risk management to prevent weapons of mass destruction from entering the country. As Deborah Cowen points out in The Deadly Life of Logistics, the tacit admission that full surveillance is not only impossible but undesirable, points to the tension between the state’s efforts to secure territory and ensure commodity circulation at the same time. In a world of fast flows, the nondescript, morose abstraction of the tin box not only secures and protects its contents within, but also systematizes a form of concealment that hides the social relations of production, and the exploitation and danger congealed in the things it traffics. As emphasized in the book Cargomobilities, illustrated below, “the entire system is geared towards keeping goods in motion”. To aid this flow, ports have moved out of cities (or vice versa) and into the outskirts, with containerization making subsequent demands on urban infrastructure in ways that often impact the most vulnerable populations at the fringes of the city. The Alameda Corridor, for example, is a rail cargo expressway that links the ports of L.A. and Long Beach to a transcontinental rail network, cutting a 10 mile long, 33 feet deep open trench through Compton, Lynwood, Vernon, and other predominantly working class, Latino and/or African-American neighbourhoods. This is why the radical resident collective L.A. ONDA refers to the Alameda Corridor (shown below) as a “wound”, a “reminder of the symbolic and material violence etched into our city’s history of capitalist development”. The cosmopolitan fetish of the container as a fixed site of residence or retail in trendy urban can blind us to its other role in displacing people in disadvantaged areas. It is perhaps the increasing exposure of this contradiction that explains why we have witnessed a resurgence of protests targeting the chokepoints of containerized flow in recent years. 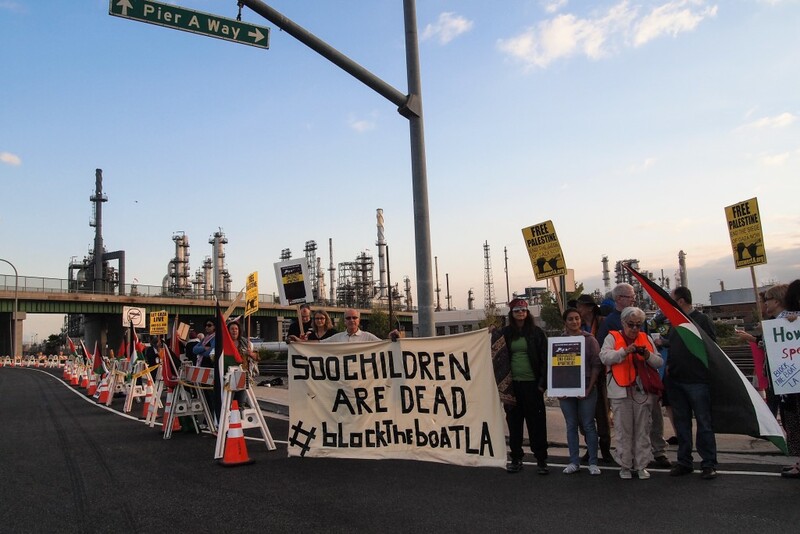 Some prominent examples in the logistics empire of California have been the Occupy shutdown of the Port of Oakland in 2011; the blockades of the Israeli-owned Zim shipping line across the U.S. West Coast by pro-Palestinian activists in 2014; and the May Day work stoppage of Oakland’s International Longshore and Warehouse Unit local in solidarity with Black Lives Matter in 2015. The desire to disrupt business as usual and stop capital in its tracks has often been the express goal of these movements, which combine both class-based and race-based interests. What the popularity of the disruption tactic suggests is that coalition and solidarity is being built through a shared experience of alienation; one whose symbolic and material face takes the form of the container and its associated infrastructures of capitalist flow. To hear more about the relationship between logistics, violence, empire and resistance, listen to this podcast. Editor’s note: This article was originally commissioned for and published in The Funambulist 6 (Jul-Aug. 2016) Object Politics. Danyluk, M. (2017). Capital’s Logistical Fix: Accumulation, Globalization, and the Survival of Capitalism. Environment and Planning D: Society and Space, forthcoming. Herod, A. (1998). Discourse on the Docks: Containerization and Inter‐Union Work Disputes in US Ports, 1955–85. Transactions of the Institute of British Geographers, 23(2), pp. 177-191. Rankin, K N. (2010). Reflexivity and Post-Colonial Critique: Towards an Ethics of Accountability in Planning Praxis. Planning Theory, 9(3), pp. 181-199.